One job I really hate doing is cleaning the house, especially vacuuming. I have two dogs, which unfortunately makes vacuuming a chore that has to be done every couple of days. I have a Shark corded vacuum which is very good at picking up the great amount of dog hair that accumulates every day in the house, but it drives me crazy with the endless cord. I end up cussing and swearing as I try not to trip or hang myself with the ever present cord. I also get upset that the vacuum cannot easily get under the bed and other pieces of furniture. I always dreaded the stress of having to vacuum and tried to avoid it as much as possible. This didn't sit well with the rest of the family! I've had cordless vacs before but they were next to useless when it came to picking up dog hair on the carpet or holding a charge long enough to finish cleaning. I thought I was condemned to a future of fighting the cord on my corded vacuum. I kept seeing a few cordless vacuums advertised on television, so I decided to do a little research. The Dyson really looked good, but the price scared me to death. I researched Hoover and Shark and saw that the Shark IONFLEX with DuoClean was rated as high or higher than Dyson, but at a much more reasonable cost. I checked it out at BestBuy and decided to buy it. I'm so happy that I did. I was shocked at how much suction it had and how maneuverable it was. With the special feature of the MultiFlex Wand I was able to easily vacuum under the bed and sofa! I could detach the wand and quickly clean the stairs or furniture and then even clean the drapes and ceiling fans! 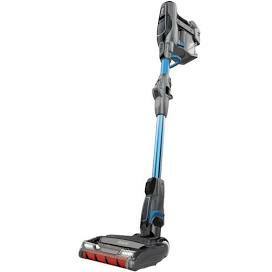 The best part of this vacuum was I didn't have that annoying cord restricting my movements! It took me some time to get used to not having to drag the cord around or stop and plug it in to another socket when I moved from room to room. I kept worrying that the battery would run down before I finished, but I was able to clean for an hour without the battery running out. It quickly recharges and is ready for the next job. I thought I would never say that I like vacuuming but I can now say that I don't mind it and I can do it without stressing out. I can vacuum every couple of days and I don't mind it. I am happy that I bought the Shark IONFLEX with DuoClean cordless vacuum cleaner and I would highly recommend it to anyone who has pets and hates vacuuming.